I'm well and truly hooked by the quilting bug!!! I'm reading, Pinning and trying to find out as much as I can about this age old craft. Garment sewing is going to have to take a bit of a back step while I start out on my quilting journey. Or, maybe I'll find more hours in each day to fit in all the things that are racing around in my head. A couple of months ago, I attended the three day Autumn Quilting Triple Treat at Blackheath. So far, I've only told you about a tiny part of one day when we made a lace motif. I've yet to tell you about the English Paper Piecing with Rachael Porter, from Stitches and Sew On, the quilting with Anne Sommerlad Designs and the Free Motion Embroidery Techniques with Recycled Fabrics, with Petal Davies. We only had a short time experimenting with FMQ (Free Motion Quilting), but I found the process fascinating. I haven't made any progress on the piece we started at the retreat, but I will finish it. Not sure when, but definitely before next year's retreat. Instead, I've begun and finished a new FMQ project... a Doll Quilt to match the Fairy Panel Quilt. 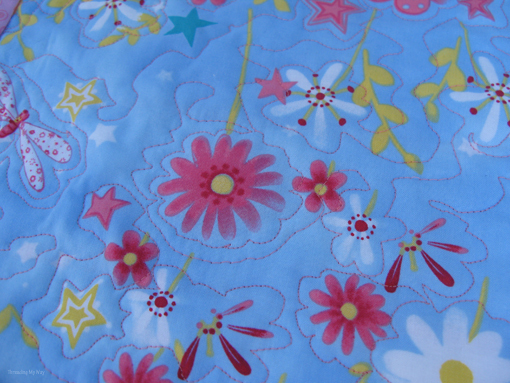 FMQ is unlike any other type of sewing I have attempted. Before you begin, you have to drop the feed dogs on your machine. Before trying my hand at FMQ, I didn't really realise just how important the feed dogs are. I knew what and where they were on my machine and I could tell you what they did, but I was totally unaware of how much easier they make everyday sewing. Instead of the machine pulling the fabric through, with FMQ you have to push it yourself. Some quilters use special gloves, while others just use their hands. At the quilting retreat, a very kind lady gave me two pieces of draw liner grip which helped a lot. I think I might invest in some gloves. What aids, if any, do you use when FMQ? Because you are feeding the fabric through yourself, it's hard to get the stitches even. I'd say it's well nigh impossible!!! Sometimes my concentration would lapse and I'd forget to push the fabric, resulting in teeny, tiny stitches. At other times, especially when I stopped, a huge long stitch would appear at an odd angle to the existing line of stitching. Tutorials talk about getting a rhythm going and I can now see what they mean. It took me three sessions to finish the quilting. I found that when I was getting tired, it was better to stop. Mind you, each time I started, it took a while to get into the groove. I'm assuming, that with practice, I'll be able to concentrate for longer periods. I started in the top left corner, with only a vague idea as to where I was headed and how I'd get there. My design changed throughout the quilt, as I experimented. 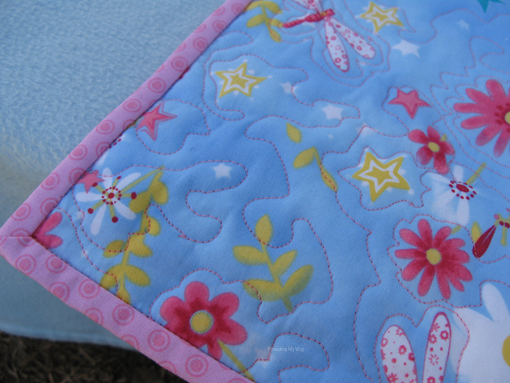 To bind the quilt, I used the same fabric as the backing, (but a separate piece of binding) and machine stitched it. If you look closely at the photo above, you can see the machine stitching. 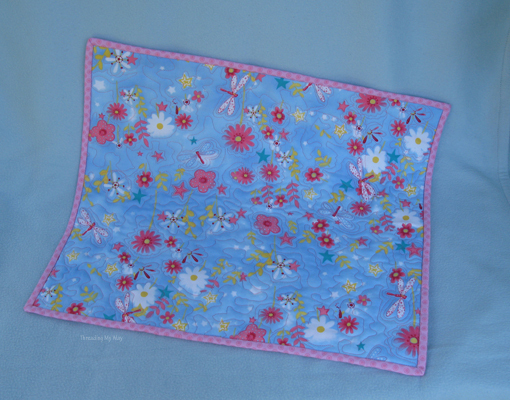 This little dolls quilt measures 21" x 18" and was a great way to practise a new skill. I didn't want to waste time using scraps. Instead, I preferred to actually produce something that could be used. Little Miss isn't going to see one single mistake in her new doll quilt, even if I can see one or two, or three or four, or....!!!! I did the quilting with a pink, Gutermann, polyester thread, so you can't really see the quilting on the back in the photo above, but it is a good contrast on the front. Basting is SO much easier on a small quilt. Look how nice and smooth the back is!!! I used left over scraps of batting from the fairy panel quilt, piecing them together to make one sheet of batting. I haven't bothered with a label, but I know Little Miss is going to ask why there isn't one. She queried the wording on her fairy quilt, wondering why her two favourite softies' names weren't on the label along with hers. Maybe the label is a project we can do together. Sounds like it was a great retreat! Nothing like a new sewing obsession! ;) The doll quilt is cute. Can't wait to see what else you try. I keep thinking I'm going to try this. I love making doll things. I love the idea of using a print to help guide the free motion quilting. I'm trying to learn to. Love Leah Day's sight. Caught your other free motion sites on Pinterest. 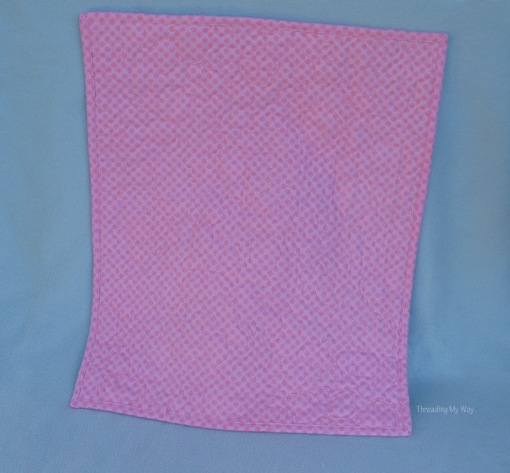 Your FMQ turned out great and you are right, your daughter won't care that it is not perfect! fab work Pam, you're doing great! You did a fantastic job with your free motion quilting! I have done a little and really like it, but it takes a lot of patience and focus! Thanks Claire Justine. The quilt is already being put to good use. Great quilting, I use special gloves but I've recently been given some small pieces of non slip rug gripper to try, if it works it would be a far more economical way to go as a roll of it only costs about £5. I've learned it's never perfect...but that quilting is very forgiving. Enjoy it as you have. 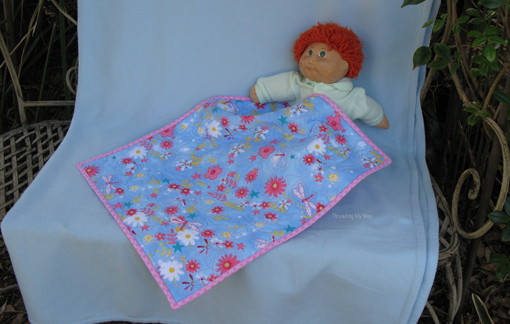 Love that doll quilt...cabbage patch doll...memories brought back there! Sounds like you are really enjoying you FMQ adventure, Pam. Love reading all the little details you shared. I use Gutermann polyester thread for everything, including my first forays into FMQ. But then I tried some Fantastico thread from Superior Threads. And their titanium topstitch needles which have a large eye. And WOW, what a difference for me! If you can get ahold of some Fantastico or Magnifico thread from them... Do it! What was a chore for me became enjoyable! Glad you love to quilt now to Pam! You have made some lovely quilts. It's fun to play with different patterns in both the quilt top and the quilting. 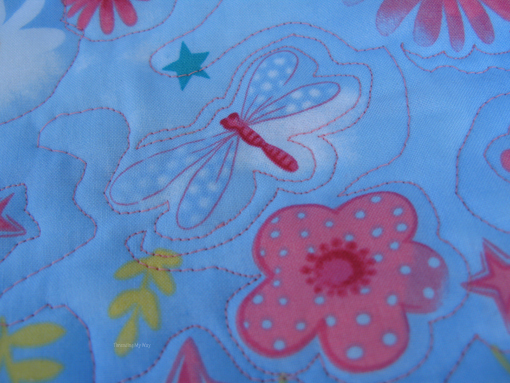 The FMQ bug is a wonderful bug to catch! 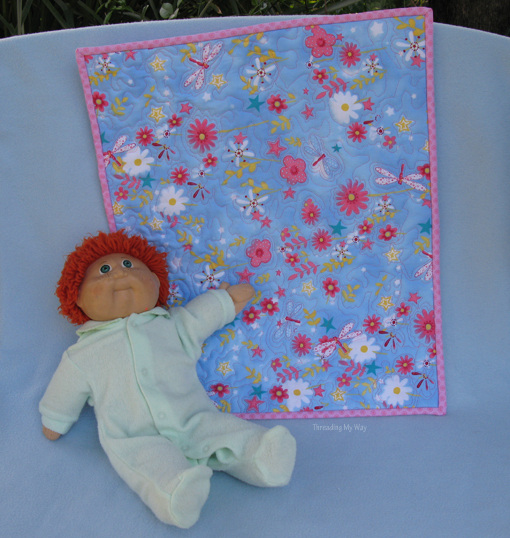 I hadn't thought to make little doll quilts for practice...I might borrow the idea for my little nieces! Quilting is such a fun addiction;) Your FMQ doll quilt is adorable and I enjoyed reading your post about English Paper Piecing. I use gloves when I machine quilt. Rubber kitchen gloves will do but there are some nicer looking quilter's gloves out there if you want your hands to look lovely. Happy Quilting! Thanks, Kathi. I've since bought a pair of quilting gloves and boy, do they really make a difference. 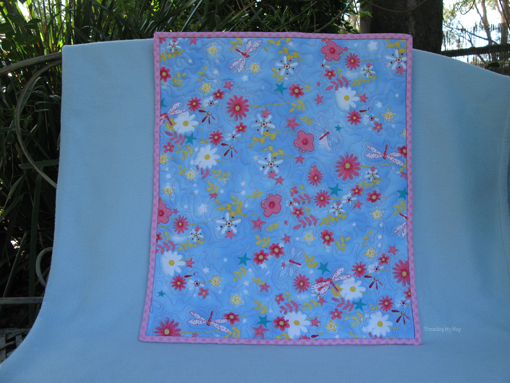 What a sweet little quilt, and congratulations on jumping into FMQ. It's like riding a bike. Once you've got the hang of it you don't suddenly forget how to do it. Watching Leah Day's videos got me started, now I never want to do straight line quilting again. I do all my FMQ on a 1945 Singer treadle - you might find my blog interesting... and it just so happens I'm doing a fair bit of dressmaking at the moment.